Finding one’s way with ease in a vast body of water filled with unknown creatures, potential currents, white caps, waves, or weeds with foggy goggles and blinding sunlight is challenging if sighting skills are weak and confidence low. I find that most people are exhaling too quickly and/or holding their breath, which feed anxiety and can result in working too hard. To help minimize this, I take students to the Boulder Reservoir and teach them how to use landmarks and the buoyancy of their weight suit, as well as how to sight effectively. I prefer to start with a private lesson or small group before joining in at the Tuesday/Thursday Boulder Aquatic Masters open water swim sessions at 6:00 a.m. I wanted to say “Thank you” again for all your patience and skill in helping me progress. I’m super happy to say that last Sunday, my husband and I finished our second Ironman – this time, on the same day. 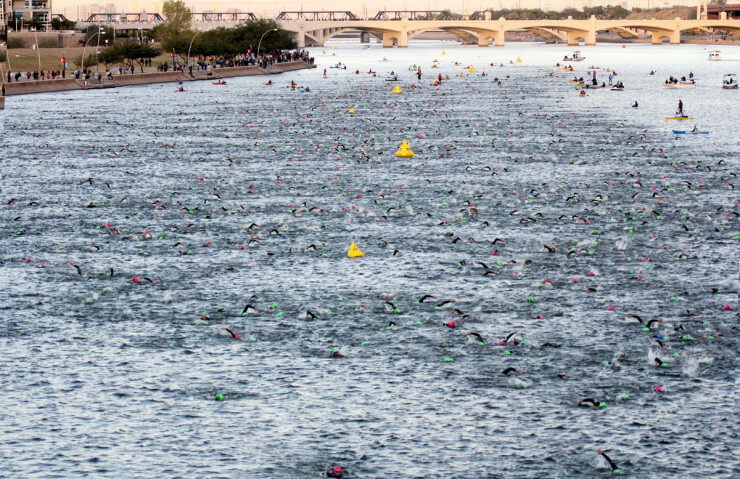 I didn’t mention our upcoming race because frankly, it made me nervous to even talk about the swim. I was trying not to overanalyze it, which I tend to do frequently. And thankfully, since I was more comfortable and calmer in the water, I was able to do it with less nervous energy spent on the day. In comparison to my other IM, I had more physical contact with others to contend with, including getting clocked in the back of the head by a big dude, which popped up my cap. And my route was probably longer than necessary because the buoys were not straight and my sighting was poor. But regardless of the time, the experience was a HUGE improvement. Thank you — Linda B.